Confirmation is taught by Rabbi Perlin. 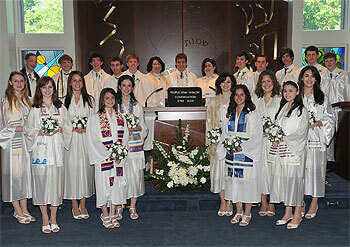 The curriculum leads students through issues essential to teenagers with the focus “How to make the Jewish Choice that is Right for Me.” The process of this class leads to the Confirmation ceremony in which students acknowledge a mature connection to Judaism through their connection with family, Temple B’nai Shalom and their classmates. Also taught by Rabbi Perlin, the two-year Post-Confirmation program provides and informal setting in which to explore contemporary issues with Moment, The Forward and a host of media as texts.